I am convinced that there is nothing in the world more glorious than a sunny day in gods own county. On a day that will be marked in history as the day the mighty British lion was led to the EU by a quisling sheep of a Prime Minister to beg for an extension to the farce that has been the ‘negotiation’ process. 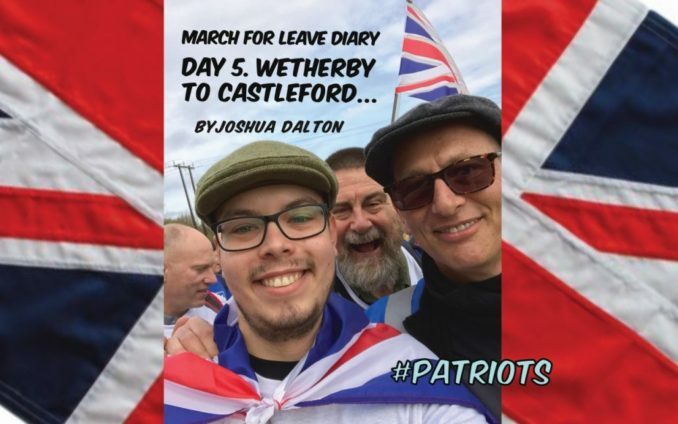 A hundred or so cheery brexiteers began the 14 mile treck from the idyllic village of Wetherby to the not so idyllic town of Castleford. The mood was positive, everyone was smiling. And there wasn’t a damned EU flag in sight! HOORAY! The happy brexiteers cheered as Richard Tice, leave means leave founder, gave us our marching orders and roused us up with a speech extolling the positive virtues of leaving the EU quietly with no deal on the 29th of March. A crowd of characters, a rabble of the righteous, a waffle of weirdos. There was not a single ‘normal’ person to be seen. No sheep, no slaves, no subjects, only freed minds and friends. But that’s the way we like it in Yorkshire, we love a good ‘character’. I had many a conversation in my hours under the Yorkshire sun. About nearby battlefields, that of Towton, the bloodiest battle in English history, and Marston moor, where Fairfax and Manchester saw off Prince Rupert and his cronies. I talked at length about the foundation of Rome, the monarchy, fall of the republic and Constantine’s conversion to Christianity. There was even time for a quick chat with a very cheery chap who runs this website. The atmosphere was un diminishingly positive. Even the ‘protest’ wagon (a big portable tv) joined in on the fun, the driver was an ardent brexiteer and all round jolly chap. No, nothing will quell, quash, diminish nor deter the attitude of brexiteers. We are a positive lot, united in love for our nation and of freedom. We have fought the good fight for the last 3 years. And hopefully March 29th will be the last time Britain requires us to do what is right for her. And we will, finally, be able to take some long, far overdue mental rest. So go out, join the March to Leave and let’s send a clear and simple message to the globalists come March 29th, “we will not be beaten”. The (British) Empire Strikes back!